The original hot chocolate recipe was a mixture of ground cocoa beans, water, wine, and chile peppers. It did not take long for Spaniards to begin heating the mixture and sweetening it with sugar. After being introduced in England, milk was added to the then after-dinner treat. The word chocolate is said to derive from the Mayan word xocoatl; cocoa from the Aztec word caahuatl. The Mexican Indian word chocolat comes from a combination of the terms choco (“foam”) and atl (“water”); as early chocolate was only consumed in beverage form. 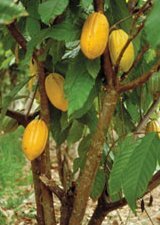 Chocolate grows on trees, appearing in its raw state as melon-like pods (see photo on right) on the 40- to 60-foot tall trees known botanically as “Theobroma cacao,” which means “food of the gods.” This tropical tree has grown wild in Central America since prehistoric times. It also grows in South America, Africa, and parts of Indonesia. The cacao tree produces a fruit about the size of a small pineapple. Inside the fruit are the tree’s seeds, also known as cocoa beans. Chocolate has been drunk as a beverage for thousands of years. Archeologists tell us that the Olmecs, the oldest civilization of the Americas (1500-400 BC), were probably the first users of cacao, followed by the Maya, who consumed cacao-based drinks made with beans from their plantations in the Chontalpa region of what is now eastern Tabasco. A drink called ‘chocolatl’ made from roasted cocoa beans, water and a little spice was their most important use, but cocoa beans were also valued as a currency. Because cocoa beans were valuable, they were given as gifts at ceremonies such as a child’s coming of age and at religious ceremonies. The Maya had very many complicated religious beliefs with many gods. Merchants often traded cocoa beans for other commodities, cloth, jade, and ceremonial feathers. Maya farmers transported their cocoa beans to market by canoe or in large baskets strapped to their backs, and wealthy merchants, employing porters to carry their wares, ventured as far as Mexico the land of the Aztecs, so introducing them to the much prized cocoa beans. 1502 – Christopher Columbus (1451-1506), the first European to taste cocoa in Nicaragua, on his fourth voyage to the New World, returned to Europe with the first cocoa beans. No one knew what to do with them and they were dismissed in favor of other trade goods. Records suggest that he did not particularly like the Aztec delicacy of “hot chocolate”- a thick cocoa drink laced with ground chiles and dyed red to look like blood – but recognizing its potential he took a load of cocoa beans back to Spain. 1519 – By the time the Spanish invaded Mexico in the 16th century the Aztecs had created a powerful empire and their armies were supreme in Mexico. The early Spanish explorers thought the primary (if not only) use of chocolate was medicinal. Chocolate drinks were developed in Spain that were seasoned with pepper, vanilla, sugar and cinnamon or mixed with beer or wine. They became such a hit that Spanish society ladies had them served during Mass. The voyage which led Hernan Cortes (1485-1547), Spanish conquistadores, to discover Mexico and the Aztec civilization began in 1517 when he set sail from Cuba with 11 ships and 600 men, all seeking fame and fortune in the ‘New World’. Landing on the Mexican coast near Veracruz, he decided to make his way to Tenochtitlan to see for himself the famed riches of Emperor Montezuma and the Aztec empire. The fact that Montezuma consumed his “chocolatl” in goblets before entering his harem led to the belief that it was an aphrodisiac. Cortes wrote a letter to Charles V of Spain calling chocolate “The divine drink which builds up resistance and fights fatigue. A cup of this precious drink permits man to walk for a whole day without food.” When Cortes returned to Spain in 1528 he loaded his galleons with cocoa beans and chocolate drink making equipment. While many recent texts and websites provide readers with a precise year and a specific event whereby chocolate was first introduced to Europe, food historians always debate “firsts” and the so-called “first” arrival of chocolate in Europe is a subject of conjecture to say nothing of myth. Chocolate may have been introduced to Europe via the Spanish court in 1544, when Dominican friars are said to have brought Mayan nobles to meet Prince Philip. I suspect, though, that this oft-cited statement is probably more allegorical than precise. It is correct to say, however, that within a century of the arrival of the Spanish in Mexico, both culinary and medicinal uses of chocolate had spread from Mexico to Spain, France, England, and elsewhere within Western Europe (entering through Spain and Portugal) and probably North America as well (entering through the Spanish settlement at St. Augustine, Florida). 1643 – It did not take long for Spaniards to begin heating the mixture and sweetening it with sugar. Soon ‘chocolate’ became a fashionable drink enjoyed by the rich in Spain. As the Spanish royalty intermarried with other European Royalty, cocoa was given as a dowry. In 1643, when the Spanish Princess Maria Theresa (1638-1683) was betrothed to Louis XIV (1638–1715) of France, she gave her fiancan engagement gift of chocolate, packaged in an elegantly ornate chest. A royal chocolate maker was appointed and chocolate drinking became the rage. 1700s – By the 1700s, “Chocolate Houses” were all the rage, as popular as coffee houses. These places were precursors of our present day cafes and bars, and they were frequented by politicians, writers, and socialites. Chocolate Set photo courtesy of Judi van der Kaay of Cottage Grove, Oregon. From the middle of the seventeenth century onwards, chocolate also enjoyed great success in Great Britain, especially after the conquest of Jamaica, which gave the British direct access to cacao production. After chocolate was introduced in England, milk was added to the after dinner treat. By the end of the 18th century, London’s chocolate houses began to disappear, many of the more fashionable ones becoming smart gentlemen’s clubs. 1765 – Chocolate was introduced to the United States in 1765 when John Hanan brought cocoa beans from the West Indies into Dorchester, Massachusetts, to refine them with the help of Dr. James Baker. The first chocolate factory in the country was established there. 1800’s – The first “chocolate box” was introduced by Richard Cadbury in 1868, when he decorated a candy box with a painting of his young daughter holding a kitten in her arms. Cadbury also introduced the first Valentine’s Day candy box. 1876 – Milk Chocolate was invented in 1876 by a Swiss chocolatier, Daniel Peter (1836-1919) of Vevey, Geneva. Daniel Peter successfully combined chocolate with powdered milk to produce the first milk chocolate. Today, the finest chocolate is still made in Switzerland, and the consumption of milk chocolate far outweighs that of plain chocolate. Agustin Farfan (1592) recorded that chili peppers, rhubarb, and vanilla were used by the Mexica as purgatives and that chocolate beverages served hot doubled as powerful laxatives. Josde Acosta (1604) wrote that chili was sometimes added to chocolate beverages and that eating chocolate paste was good for stomach disorders. Santiago de Valverde Turices (1624) concluded that chocolate drunk in great quantities was beneficial for treatment of chest ailments, but if drunk in small quantities was a satisfactory medicine for stomach disorders. Colmenero de Ledesma (1631) reported that cacao preserved consumers’ health, made them corpulent, improved their complexions, and made their dispositions more agreeable. He wrote that drinking chocolate incited love-making, led to conception in women, and facilitated delivery. He also claimed that chocolate aided digestion and cured tuberculosis. Henry Stubbe (1662) wrote that consumers should drink chocolate beverages once or twice each day to relieve tiredness caused by strenuous business activities. He reported that ingesting cacao oil was an effective treatment for the Fire of St. Anthony (i.e., ergot poisoning). Stubbe also described chocolate-based concoctions mixed with Jamaica pepper used to treat menstrual disorders, and other chocolate preparations blended with vanilla to strengthen the heart and to promote digestion. Melting chocolate is not the same as Tempering Chocolate.It is not necessary to temper chocolate when it is used as an ingredient in a recipe. Tempering is necessary if the melted chocolate is to be used in a baked items or in a candy center that contain other ingredients. The development of milk chocolate by Daniel Peter changed the flavor of chocolate around the world. In 1887, Daniel Peter adopted the original formula for what was to become the first successful milk chocolate in the entire world. Peter called his product, “Gala” from the Greek, which means, “from the milk.” Daniel Peter worked in the Nestle factory in Vevey, Switzerland until he was in his 90’s. Ancient Chocolate Found in Maya “Teapot”, By Bijal P. Trivedi, National Geographics Society, July 17, 2002. Chocolate Cookery, General Food Corporation, New York, 1929. From Aphrodisiac to Health Food: A Cultural History of Chocolate, by Louis E. Grivetti, Karger Gazette, No. 68 Chocolate. Gage, Thomas, by Hether Sebens, The Historical Text Archive. When The Church Said “No” to Chocolate, by Ann Ball, Mexico Connect. The True History of Chocolate, by Sophie D. Coe and Michael D. Coe, published by Thames and Hudson Ltd, London, 1996.